Since taking the Americorps position in Washington, I have been crazy busy planning my cross-country trip, looking for housing, trying to determine what people wear in places where it snows…. I have had very little time to cook! Thank goodness that I have an arsenal of quick, yummy, and if I do say so myself, BEAUTIFUL dishes up my sleeve. 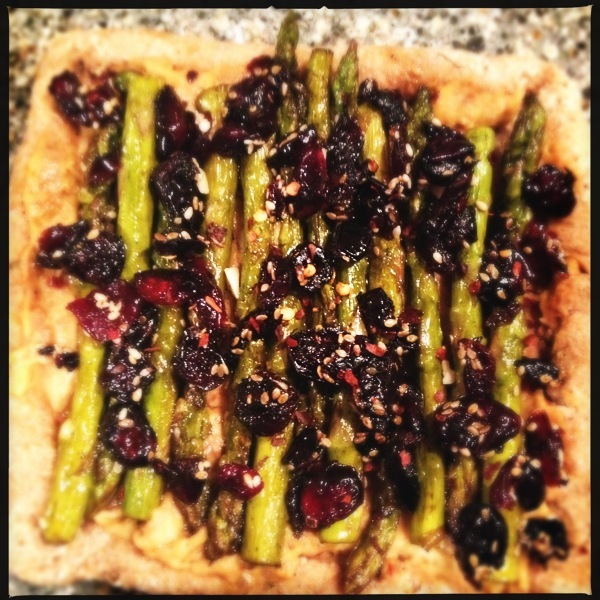 Tonight, between arranging for housing, laundry and PBS’s showing of the Phantom of the Opera, I will be making a Sesame and balsamic glazed asparagus cranberry tart. I used half as much as the original recipe as I was cooking only for myself. Also, I used organic wheat flour instead of all-purpose flour, which is totally passé. I used regular sun-dried tomato hummus but you could probably use anykind of spread / chutney / whatever with similar flavors. Start by mixing the flour, salt, pepper and herbs together. In a separate bowl, whisk the club soda and olive oil together until it looks foamy. Add the wet mixture to the dry and stir with a fork until the dough comes together. Use your hands if you have to and if you feel that you need more moisture, just add a little bit of soda water. 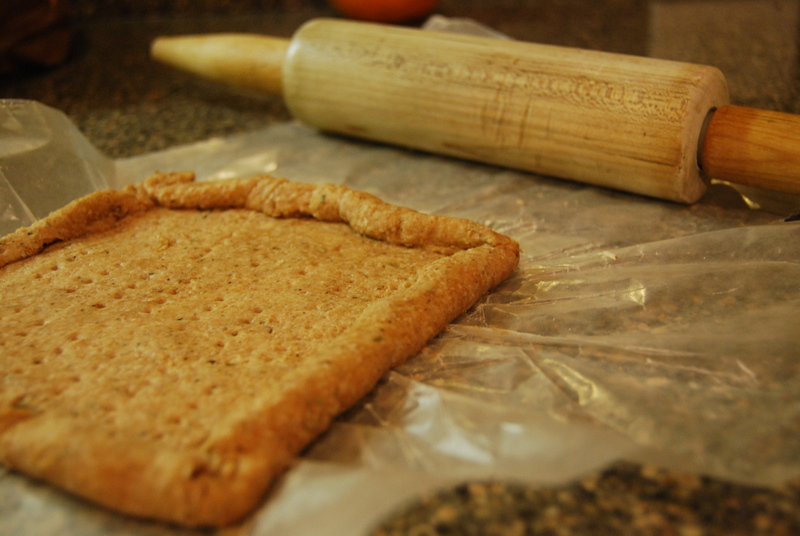 The dough should be more crumbly than stretchy. Next, roll the dough out between two layers of parchment paper. 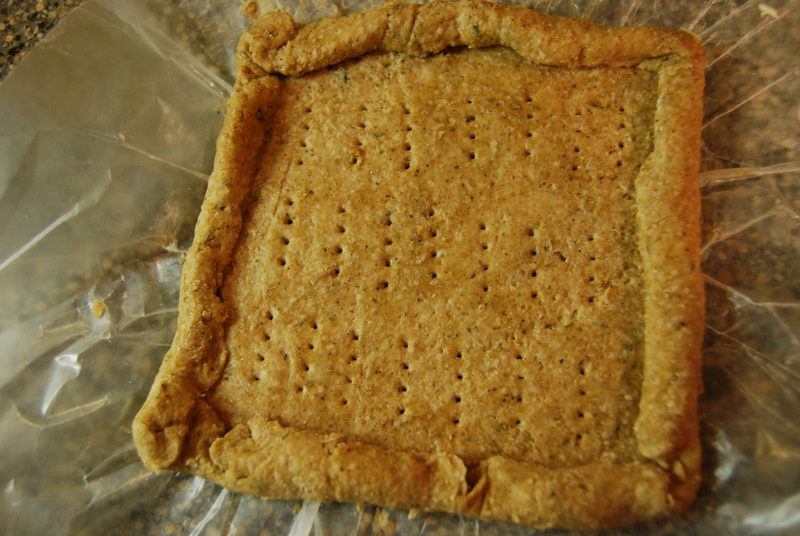 Roll the dough into a square about 4′ by 4′. I am not very good at straight lines so I simply rolled up the edges so that it looked a bit more… square. Make sure that the tarte isn’t too thick as the dough will not retain it’s necessary flakiness. Score the entire tarte with a fork. Bake the crust on the parchment paper at 400 degrees F for 12-15 minutes or until the crust is firm. 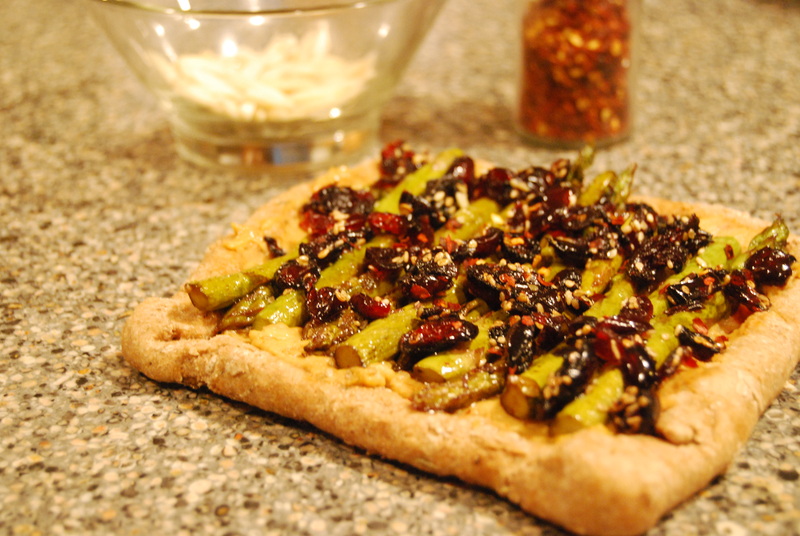 In a skillet, add the olive oil, sesame seeds and some roasted red pepper flakes and heat until the seeds sizzle a bit. The throw in the cranberries and trimmed asparagus. Toss until they are coated with sesame seeds and oil. Add the balsamic vinegar and salt and toss until well coated. 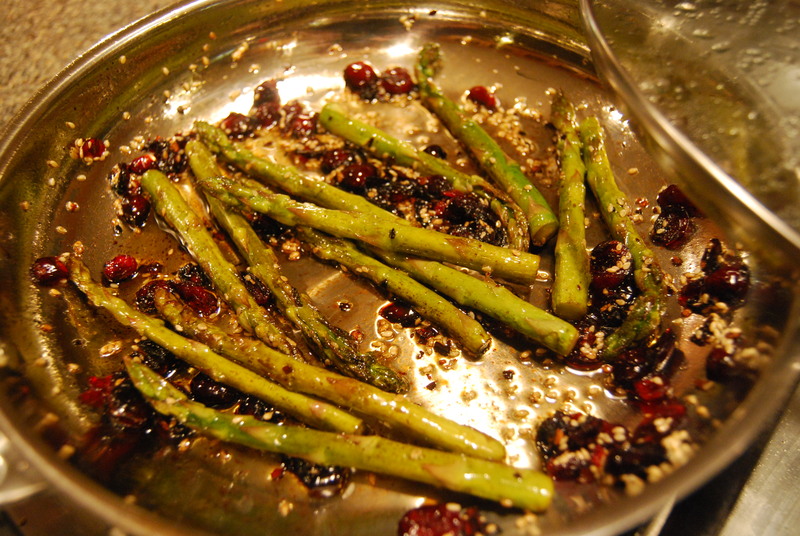 Cook the asparagus and cranberries for about 5 minutes until they are slightly tender but still crunchy. 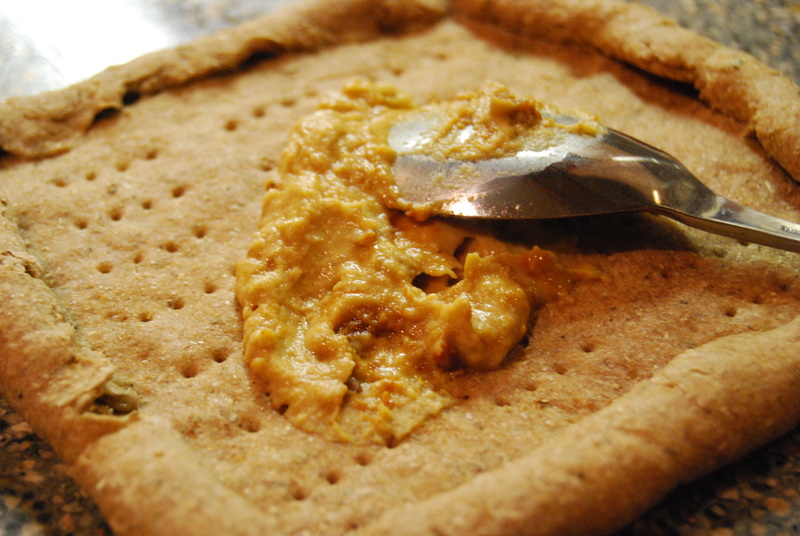 Wait until the pastry is cool enough to handle and then spread you hummus (or whatever else you chose) on the top of it. Arrange the asparagus on top of the hummus trying horizontally in a tightly packed line, allowing for little space between the spears. Toss the cranberries on top and garnish with some slivered almonds. Put back in the oven at 350 degrees F, just long enough for the tart to completely warm up. Enjoy!